Add a sweet touch to your special occasion with Hershey's Assorted Miniatures. 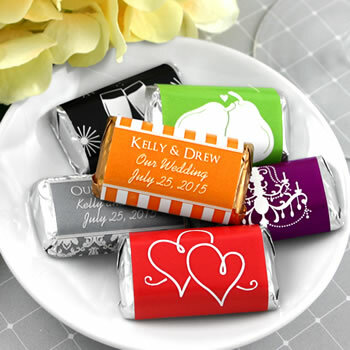 These mini candy bars are so charming they are almost hard to eat! Hersheys Miniatures offer a variety of chocolate bars for everyone. The bars come in an assortment of Milk Chocolate, Krackel, Special Dark, and Mr. Goodbar. Please note that Special Dark® Miniatures have gold foil ends. Allergy Information: Mr. Goodbar Miniatures contain peanuts. For complete information regarding any Hershey's products, please contact The Hershey Company. The personalized treats were perfect table favor for our rehearsal dinner. Excellent chocolate with a personal touch.